Imagine fishing all day on a beautiful, pristine lake with good friends and finally, at the end of the day, you return to our lodge where a fabulous meal awaits, and, later, a crackling fire and restful nights sleep on wonderful beds – then, the next day, getting up and doing it all over again! What would a day or two like that do for you? For your family? For your friendships? For your business relationships? Take a look at the KFS Bass Fishing Video and the KFS Bluegill Fishing Video. Richmond Mill Lake is, and will continue to be, protected from the fishing pressure placed on most waterways. 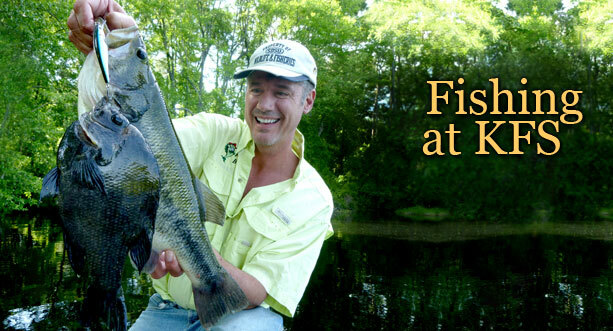 We intentionally limit the total number of fishing days available each year. Our fisheries’ biologist, the world-renowned Bob Lusk, editor of PondBoss magazine, and his team of lake managers continuously evaluate water quality and maintain the highest standards in every aspect of the management of Richmond Mill Lake.